From 1901, a wild spoof of the handiwork of Carrie Nation in Kansas by Steve Porter. Announcement "Carrie Nation in Kansas, sung by Steve Porter for the Columbia Phonograph Company." With temperance figure Carrie A. Nation (1846-1911) prominent in 1900 newspapers for taking on illegal saloons in technically dry Kansas, the hatchet-wielding Nation was ripe for a bit of spoofing at the hands of recording artist Steve Porter on this late brown wax cylinder. "I felt invincible. My strength was that of a giant. God was certainly standing by me. The unorthodox and impressive (she stood 6' tall at 175lbs) Carrie  also spelled Carry  Nation's tactics landed her in jail on several occassions, but also brought the matter of prohibition to the forefront. 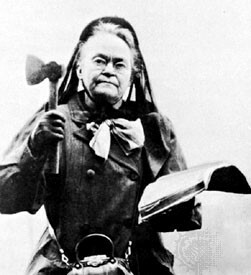 A mini-biography of Carrie Nation presented courtesy of Wikipedia online encyclopedia. Backgrounder on temperance movements courtesy of the Columbia Encyclopedia, 6th edition. An article about Carry Nation, along with a period political cartoon, courtesy of the Outlaw Women website.